Hungry Girl: 200 Under 200 & Three Chances to Win! Hungry Girl and FBG go way back. Last October, Lisa Lillien (aka Hungry Girl) became our first FitStars interview. Getting that first interview with a celeb was a big step for FBG, and we’re totally grateful that she gave us the time of day (because it helped us talk to Bob!). Over the years, Hungry Girl has grown from a simple email newsletter with low-cal snacking tips and recipes to a full-out best-selling author with not one but two books. I’ve tried a number of HG’s recipes over the years, including her delish chocolate pumpkin muffins and her uber low-cal fettuccine alfredo (using those unique Tofu Shirataki Noodles), and once I heard that she had another book coming out, I had to try it. 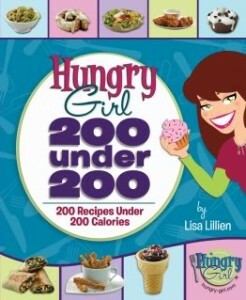 Hungry Girl: 200 Under 200: 200 Recipes Under 200 Calories delivers just what it promises: 200 recipes, each with less than 200 calories. Many of the recipes are single-servings, while some of them easily feed two, four or even 12 (think desserts like cupcakes). The idea for all of the recipes is that instead of eating an energy bar or granola bar for a snack, you can eat one of these “mini-meals,” which range from wraps, mini pizzas, smoothies and even banana bread. In my opinion, the concept rocks. Below is a play-by-play of the recipes I tried. As you’ll see, I wasn’t crazy about them all, but there are definitely some standouts. For a “snack,” these weren’t exactly quick or easy to make, but they sure were delicious. HG ingeniously uses low-fat crescent roll dough to make these puppies, which are sweet, cinnamony and, as their name states, gooey. Tip: I wasn’t a huge fan of the cream cheese icing (it uses Cool Whip Free and fat-free cream cheese, which had a weird consistency and taste for me) and actually liked these rolls better without it, so save yourself a step and some cals and eat them plain! No complaints on this one. Made from Egg Beaters, this scramble is simple, tasty and filling. The only prep is to chop up some onion and tomatoes, which is a small price to pay for a tasty breakfast. I doubled this recipe and shared it with my hubby, and even he enjoyed it. Tip: To make this really Greek, throw in some chopped kalmata olives. They’re so flavorful that just a couple really add some good olive-y goodness. A mix of a chicken salad, regular salad and slaw, I really, really liked this one. As long as you have some grilled chicken breasts already prepared (on the weekend I like to grill a couple for dinners all week long), it’s a cinch to drain a can of Mandarin oranges and water chestnuts and mix it with broccoli slaw and some scallions. Top it with low-fat sesame dressing, and you’re done. The entire recipe serves five, but my hubby and I were full splitting this (40/60 since he’s bigger) for dinner. I’ll definitely be making this one again. Tip: Make this dish even more of a meal by serving it within some wheat tortillas. Tasty. With a base of sugar-free vanilla pudding, Cool Whip Free, crushed Reese’s Puffs cereal and reduced-fat peanut butter, this one sounds a bit odd, and isn’t “natural” by any means, but it’s pretty darn tasty. This light and fluffy dip was pretty yummy when dipping apple slices and pretzels into it. And, with only 49 calories per two-tablespoon serving, you really can feel good about splurging on this decadent-tasting treat. Just remember that your dippers aren’t included in the calorie count. Tip: The recipe calls for a no-calorie sweetener packet, but the ingredients are sweet enough that you really don’t need it. This one was probably my fave of all the recipes I tried. With just 129 calories per serving, you get a HUGE amount of savory pumpkin-y and cheesy Tofu Shirataki noodles. I ate this one for lunch with a few steamed veggies on the side and was filled up for hours. You have to do a little onion chopping and dirty a few bowls, but it’s worth it. I’ll definitely be making this one again. Tip: The recipe calls for light soy milk, but skim milk works just fine and only adds a few extra cals. Also, if you can’t find Tofu Shirataki Noodles in your area, make this with one cup of wheat pasta for about 100 more calories. Need a vacation? Whip up a batch of these, put on some Bob Marley, kick up your feet and imagine yourself on the beach. These cupcake’s piña colada-y goodness are sure to transport you to a Jimmy Buffet state of mind. The recipe calls for only two cups of yellow cake mix, which is a tad annoying because now I have about a cup and a half of yellow cake mix chillin’ in my cupboard (what am I supposed to do with that?! ), but it’s a small price to pay for a mini mental vacation. Tip: These are pretty heavy on the pineapple, so if you like your piña coladas more coconuty, add a smidge more coconut extract than called for. Huh? Chocolate cake in a microwave? This one sounded odd to say the least, but it worked…deliciously. You basically take some devil’s food cake mix, add some fat-free vanilla yogurt, nuke it for a minute, and then top it with Cool Whip and light chocolate syrup. It’s a quick and tasty dessert akin to a brownie or cake sundae you might get at a restaurant. Seriously. And with just 123 calories a serving, if you’re really, really craving chocolate, you can have another. Tip: The recipe calls for devil’s food cake mix, but I tried yellow cake mix and it was just as tasty (although, obviously, with less chocolate). Try it! Tip: Again, HG calls for a packet of no-cal sweetener, but I thought the honey added plenty of sugar on its own, so you can totally forgo the Splenda and have a totally natural dish! Overall, this book is totally worth having on your cookbook shelf if you’re someone who has processed food cravings and needs a low-cal outlet for enjoying them. If you’re craving pizza, chocolate cake or buffalo wings, this book is your ticket to snack heaven. Now, if you’re a totally clean and organic eater, this book probably isn’t going to be your cup of tea, as only a handful of recipes would suit your palate. HG uses a lot of pre-packaged sugar-free pudding and Splenda, and there’s an entire chapter devoted to Cool Whip Free. Now I’m no perfect eater (by any stretch of the imagination), but when I went to the grocery store to stock up on HG supplies, I hardly recognized my own cart. I usually stick to the perimeter of the g-store (think produce, dairy and lean meats), but HG had me heading down the baking aisle, snack aisle and picking up a cereal I’d probably never have in my home (read: Reese’s Puffs). As someone who eats a little bit of everything (eating clean 100 percent of the time just isn’t livable for me), I remedied this situation by doing a lot of substituting. Honestly, I’d rather have regular sugar than Splenda and eat the extra 20 calories. Although I do love her idea of eating these mini meals or snacks instead of an energy bar, not all of her recipes lend themselves well to “snacks” as these mini-meals can take as much preparation time as a full meal. It’s hard for me to find 30 minutes to cook some cinnamon rolls, no matter how tasty they are. Granted, the Gooey Cinnamon Rolls with Cream Cheese Icing were probably the most time-intensive dish I made, but, for me, snacks need to be fast and easy to eat with minimal dish washing. I found it helpful to double or even triple most of the recipes so that they could serve as a full dinner or as a side dish with dinner. For example, I ate two servings of the Scoopable Chinese Chicken Salad for dinner and then had the Mini Microwave Triple Chocolate Cake for dessert. The really good news is, that with this book, the mix-and-matching possibilities are deliciously endless. Fit Bottomed Line: If you like HG’s approach to eating and enjoyed her last book, you’ll love this one. Want to call this book your own? Comment below with why you’d like to win or email us at contact@fitbottomedgirls.com by next Wednesday, and we’ll enter you to win one of THREE giveaway copies. U.S. residents only please. Woohoo!